Good cause alert! Support the Jack Vasel Memorial Fund! There's a copy of the upcoming Story Realms Deluxe Set (when it ships in 2013) AND an exclusive opportunity to work with the designers to create a custom Ally or Enemy Lore card that will be fully illustrated and included in the final game! You can contribute to a great cause AND have your creation immortalized in the world of Storm Hollow. Pretty cool, eh? Check it out before it ends Nov 18th!!!! Here is the link for Story Realms. 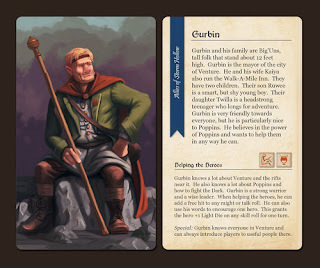 Example of an Ally lore card. Also, of much less note, I am auctioning off building a custom Pathfinder character. A tailor made PC for you or a friend, a campaign villain, a cohort or love interest, I'll build it for you. Whatever specifications you want! Here's the link to that. I'm sure you have the know-how to build your own character, but it's for a good cause. 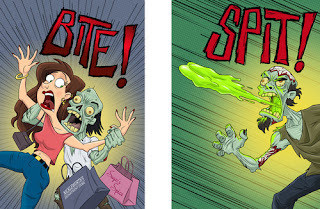 Interview with Derak Morrell, designer of We Are Dead: Zombie Mall Massacre! Craving brains? 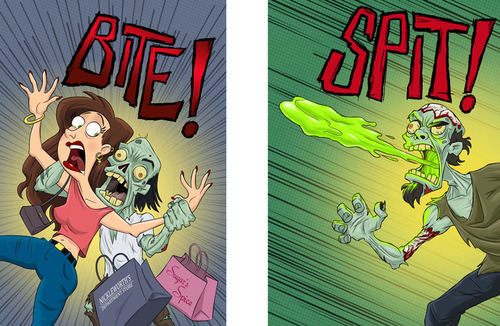 I recently ran across Derak Morrell, the designer of We Are Dead: Zombie Mall Massacre via social media. I saw the art of his game on Kickstarter and was very impressed. 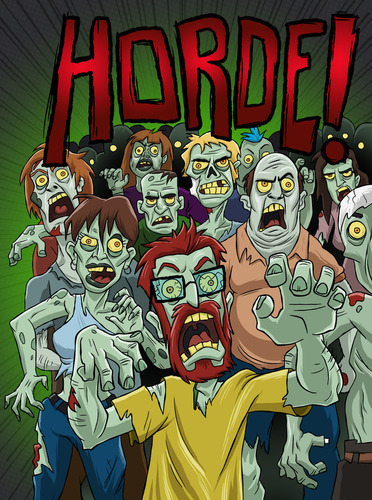 We Are Dead: Zombie Mall Massacre is in the last week of its funding campaign and I wanted to talk to Derak about this game, game design and Kickstarter. Here we go! stand out among similar-themed games? GUG: What came first: the theme, or the mechanics? feel or do during the game and then I use mechanics to bring that to life. the zombies and from there used elements that would stage that event. smaller comic conventions in Southern California "shopping" for artists. emails later and we went into art production. whether writing or designing a game, you have to make tough choices. Sometimes, that means abandoning a mechanic or sub-theme that doesn't fit. What was the toughest decision you made in the design of We Are Dead? character and a zombie character, but it wasn't fluid enough for the game. reactions on other players' turns. you try the more traditional approach of pitching the game to publishers? can name a card or even help design one for the expansion! GUG: Who will most enjoy your game? aggressive and defensive play styles. designers, especially those looking to self-publish? DM: Do your research. There are so many different aspects to self-publishing. financial burden or you can't get the game into the players' hands. 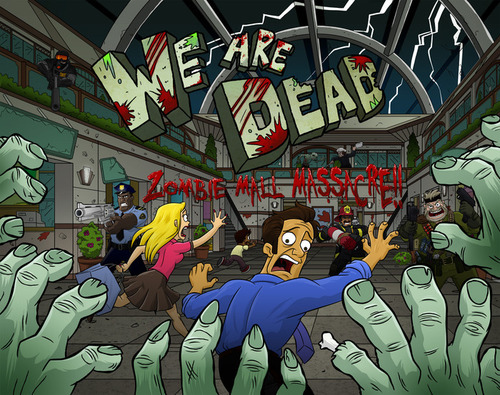 We're looking forward to trying out We Are Dead: Zombie Mall Massacre, and hope Derak the best. I for one am hoping to see him hit all those stretch goals for the player miniatures! Please pop over and take a look at We Are Dead: Zombie Mall Massacre on Kickstarter, or join in the discussion on their entry on BoardGameGeek. Do you like odd characters, strange stories, simple game mechanics, and incredible steampunk art? How about all of that with a side of MURDER!? 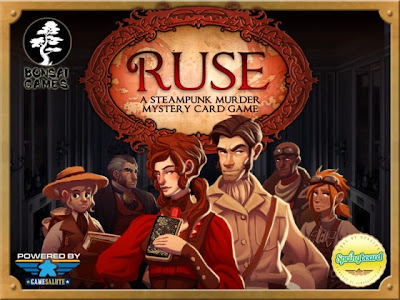 If that sounds intriguing at all, you may want to check out Ruse, a steampunk murder mystery card game for 3-5 players that plays in less than an hour. Ruse has a Kickstarter Project going until November 15th. In Ruse, players take turns trying to play evidence cards on each other. If a player ever has a motive, means, and opportunity (3 different cards) in front of them at the end of their turn, they are unmasked as the murder. The game deck doubles as a standard deck of cards so it has four suits that run Ace through King. As soon as a player has one piece of evidence played on them, that establishes their suit. Only cards of the same suit can be played on them in the future. There are also alibi cards. Alibi cards can be played to remove a piece of evidence that is the same number. So if that incriminating gun in front of you is also a 5, you need an alibi that’s a 5 to get rid of it. The suits and numbers for evidence and alibis have two wonderful effects on the game. First, it makes the gameplay simple to follow. It’s easy to see where you can and cannot play cards. Second and most importantly, it lets the evidence and alibis fit together thematically. Cards from the same suit work together and make sense as a combined motive, means and opportunity. Alibi cards of a certain number are reasonable ways to get rid of the evidence they remove. For example, in the game we played I played “Clockwork Rifle” as evidence on Angie and she played “Out of Ammo” as an alibi. It makes sense and we didn’t have to read any text on the cards or in the rulebook to know they lined up. They were just both Aces. The Ace method card was Victorian Pistol and the other Ace Alibi was Fear of Firearms. You can any combination of method and alibi that’s an ace works well together and tells a story that’s intuitive. This is important because the mechanics of Ruse aren’t really the point. "Hmmm... that seems quite suspicious"
Now it's true that Ruse looks like a card game. Appearances can be deceiving, however. In reality, Ruse is an ever-changing tale of foul play. At its heart, Ruse is really a storytelling game. You are not supposed to just play evidence on another player. When you play evidence, you are supposed to tell a story about the clue you've discovered and how it makes them a murderer. When I played that Clockwork Rifle on Angie, I mentioned that I had heard the victim was shot from long range and I’d seen her cleaning a clockwork rifle just the other day. When she played Out of Ammo as her alibi, she called me a fool and said that I obviously had no idea how rare and expensive ammo was for a clockwork rifle. She’d been out of ammo for weeks and had yet to find a way to purchase more. These stories are not just for added flavor, they are the real fun of the game. The simple mechanics and beautiful art facilitate an evening of wild accusations and ridiculous excuses. The suits and number work together to make those stories even easier and more fun to tell. "Another piece of evidence points to... YOU!" You don’t even play Ruse until someone wins. You play Ruse until one player loses. This may sound unfortunate for the loser, but Ruse actually rewards the murderous lout. The “winners” may get to rest easy knowing they will not be going to jail for homicide, but it’s the loser of the game that gets to spin a tale using the three evidence cards in front of them about how they committed the murder and why. In our game, it was little Katie that was revealed to be the cold-blooded killer. She told us the horrific truth. She’d siphoned money away from the account she had with her business partner to build a secret a lightning generator machine. She installed that lightning generator in the back of his car and angled it so it would strike only him. Then, in a final act of evil, she offered to drive her partner as a chauffeur and fried him with lightning after telling him of her betrayal. A shocking tale to be sure. So young and yet so villainous! It was really a highlight of the game to hear Katie weave together a great story from the cards she had been given, and she exclaimed after that not only did she love the game, but she thought losing was the best part! "So, you caught me! Well, let me tell you what REALLY happened. It was a dark and stormy night..."
We had a lot of fun with Ruse. If you let yourself get into the storytelling of it, you get to have some very amusing banter and an awesomely absurd murder investigation. The Ruse Kickstarter Project has already been funded and they’ve reached their first stretch goal. They’ve also recently decided to combine one of the stretch goals with another and lowered all of the rest of their stretch goals down. This means if you decide to go back it, you’ll be guaranteed the game is getting made, and you’ll be even closer to reaching some of the fun stretch goals they have in store. Side note: While the instructions for Ruse state the game is for ages 12+, we had an absolute blast playing this with little Katie gamer (who is about to turn 7). She has been asking to play it again and again and really loves the theme, art, and simple gameplay. The story-telling aspect was by far the most exciting to her, so if you've got a little one who loves to tell great tales (and you feel the "murder" theme is appropriate) then Ruse can be a great family game for kids well under the recommended age of 12. The biggest limiting factor would be the ability to read the cards, but Katie was able to figure out the pictures and themes well enough with her emerging English reading skills. -Angie.N.